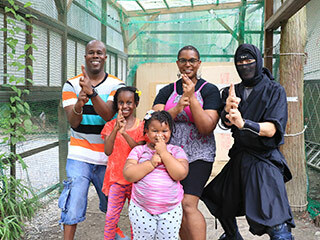 Ninja is one of the most famous and popular feature of Japan. Ninja is actually samurai which has special skill of Spy activities. Some times, they are also called as "Kusa" "Rappa" or "Shinobinomono." Each Daimyo had their own Ninja organization. And here is the spots of all Ninja related cities starting with Iga of Hattori Hanzo. Ninja Museum of Igaryu (伊賀流忍者博物館) is one of the real Ninja Museum located in Mie Prefecture. Iga Ninja Style is one of the two most famous Ninja Style and this museum shows all kinds of information about Iga Ninja. They replaced the real Ninja House from the Ninja Village of Iga that has all kinds of Ninja tricks that's been used in real. At the museum section, it displays all kinds of Ninja weapons, tools and clothing. It has also a great Ninja show. Admission: 750 for adult, 432 yen for under junior. There is a group discount. Extra fee for the Ninja Show: 400 yen. They have a rental of Ninja Costume.